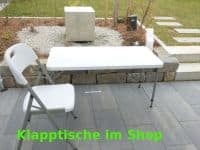 3x3m foldable Canopies are nothing new . What ist the difference of Compact Canopy? Set up it looks like an other foldable tent. Solid, rain proof and off course there are many different colours available. The difference you see when you fold the frame and load it into your car. 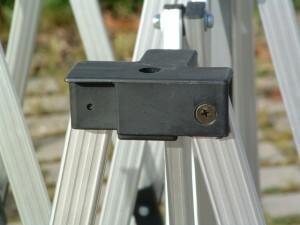 A standard frame has a pack size of around 1,6m length. That means you need a station wagon and have to lay down the rear seat that your canopy fits into the car. 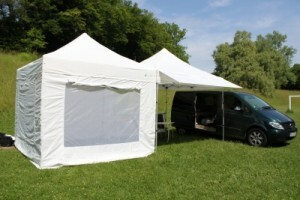 Compact Canopy 3x3m Canopies fold down to 1m and fit even in a standard limousine! Compact Canopy is easy to handle. 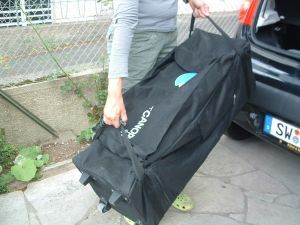 The small pack size combined the the carry bag on with severall handles makes it easy to load the frame without causing damage to the frame or your car. 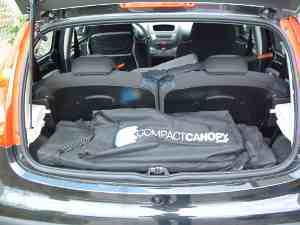 Load Compact Canopy even in a small car. All seats are free for passangers – or if you use the canopy for business you have more space for goods and samples. 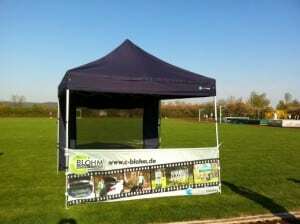 You can load Compact Canopy foldable 3m canopies crosswise. Your advantage: You load it last and have it first. Instead of unloading all goods and samples before you get a hand on your canopy you just pick it out and set it up first. Your benefit: During rain all other material stays dry. 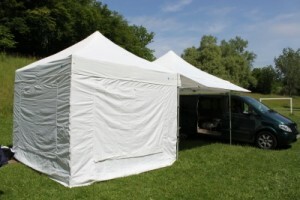 You set up the tent, drive the back of your car under the roof and unload from your car directly into your booth. Just one example of smart sollutions. 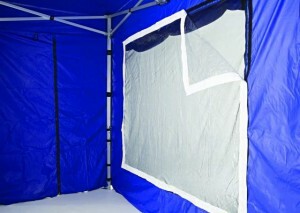 The wall kit: The Compact Canopy wall kit includes 4 walls. 1 closed wall, 1 with door and 2 with mesh window. The mesh window offers some benefits that standard PVC windows don’t have. The mesh windos keeps insects out but gives a nice ventilation. Espcially on gras ground the air in the tent becomes extremly humid after a while. PVC windows collect more sun and generate more humidity under the roof. The mesh window lets fresh air in. Close the window if you want. Fresh air is a nice thing and also some light in your canopy. But sometimes you don’t like that other people can see you. E.g. you use Compact Canopy as dress room on a sports event. No problem, just close the window and you are on your own. Wind, views or rain stay out. 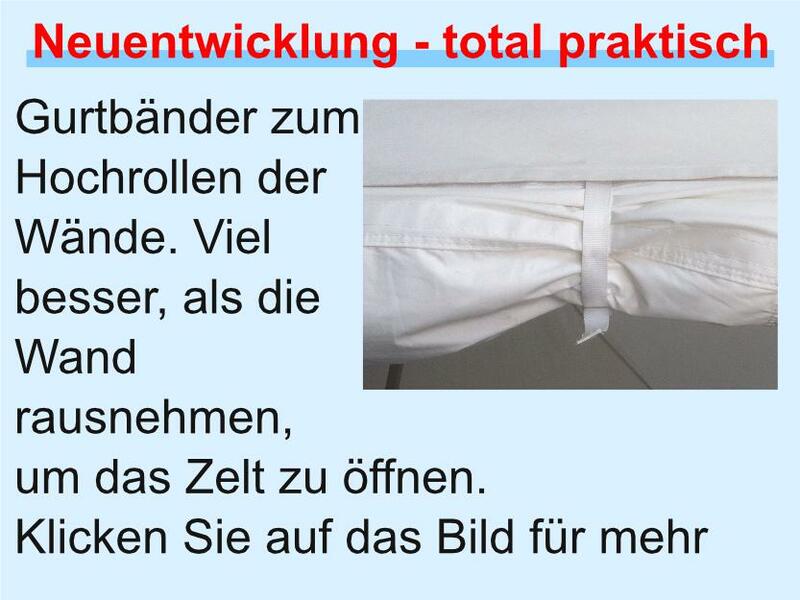 Roll down the flap, close the zippers and its done. The window has a velcro frame on the inner side. Take the PVC window from our accessorey range and let the light in / keep the rain out. We keep stock of all spare parts and if not on hand we take a frame and „extract“ it. There is nothing that rectifies a waiting customer. 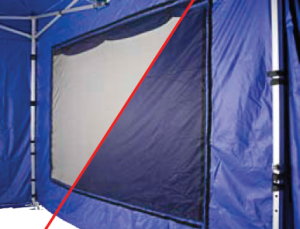 There are many more features that make Compact Canopy easy and safe to use. You want to know more? Just right us an e-mail or pick up the phone.